If I were asked to describe American Horror Story in three words they would be; Bloody, weird and triggering. AHS is not for the faint-hearted. That's for sure. Essentially, each season is set in a different time period, setting and is centred around a different type of monster/ villain or creature. That means that you can watch the seasons in any order you like and it will make sense. There are seven series; Murder House, asylum, coven, freak show, Hotel, Roanoke and Cult. Admittedly some of the seasons are better than others. My favourite is the original series, but that's because they are always are. That being said I did like Roanoke. I found the concept of having a documentary format fascinating although, by the time it got to the end, it was getting a bit boring and overdone. Each series is very different though, and that's the beauty of AHS. I would give you a fair warning though. American horror story is violent, bloody and gory. They don't make any cutbacks when it comes to showing you death and murder. You will see the most violent of murders, disembowelments and lots of blood. I've got a strong stomach, but even some of the scenes get to me. If you appreciate good quality horror, I couldn't recommend American Horror Story enough. Something entirely different than AHS and is much better suited to the more faint-hearted is Atypical. This Netflix Original is based on a teenage boy called Sam who has Asperger's and his family; his mother, father and little sister Casey. The show follows Sam on his adventure to start dating. Dating isn't easy for most, but for someone on the autism spectrum, it's pretty much-uncharted territory. What I like most about Atypical is how it doesn't just focus on the life of the individual is also focuses on how living with someone with autism can have such a significant impact on the rest of the family. Including the neglect felt by other siblings and the strain, it has on the relationship of the parents. I think it's important to have a range of perspectives when it comes to looking at conditions such as autism, especially when the primary focus is always on the child with autism. I'm not autistic, and therefore I don't think it's fair for me to say if autism is portrayed accurately or not. However, I do know a bit about autism, and I do believe Atypical does an excellent job of educating the audience about what ASD is and how it affects individuals. Although cheesy at times, I do like the characters especially Sam and Casey. Episodes are only 30 mins each, and there has just been one series so you could pretty much whizz through atypical in no time at all. If you don't know what Stranger Things is, you must have been living under a rock for the last few months. With the arrival of season 2, you'll be hard pushed to find someone not talking about it on your social media timelines. But rightly so, Stranger Things is something which is incomparable to anything else I've ever watched. The first season is focused on a young boy going missing, and the arrival of a young girl called eleven. Where has Will gone? And who is this mysterious girl? You follow three of Wills friends who try to answer these questions. But discover more than they ever imagined. Maybe Will's Mother, Joyce isn't going mad after all, and there really is something out of the ordinary going on. One of my favourite things about Stranger Things is the characters. Although no one in the series, who is particularly famous, they are all fantastic actors. You really get to know everyone and watch their relationships develop. I felt sadness for Joyce as everyone thought she was having crazy delusions. I was fond of eleven from the start, and I was determined to watch the boys get their best friend back. I really don't know how to describe Stranger Things apart from it being very strange (pardon the pun) if you love anything mystery related this will be up your street for sure. If you are worried about jump scares or gore you're pretty safe with this series. It really is a gem that everyone needs to watch. 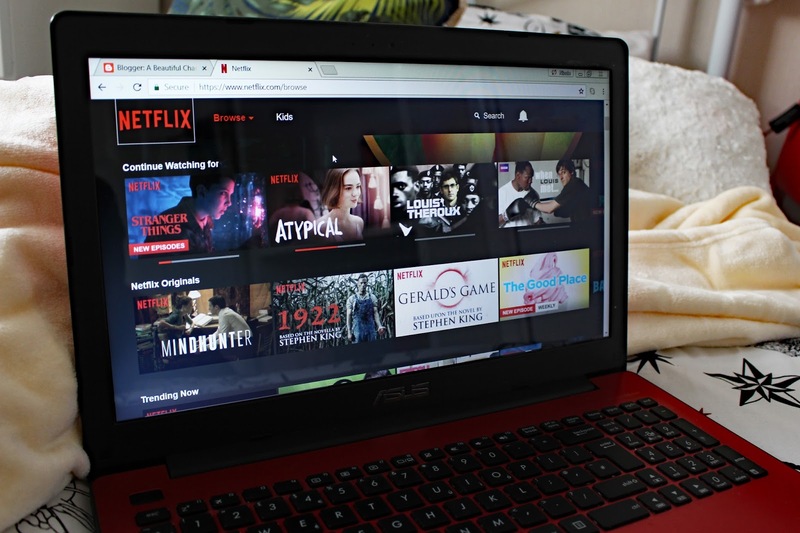 As I've said before, I can easily do many more of these posts as Netflix is a hidden treasure trove of fantastic movies and TV shows; some of which are Netflix Originals. I would love to know if you have watched any of these shows that I've mentioned or any recommendations you have for me. Let me know in the comments below. Oooh, I'm always looking for new shows to watch! I'm way too much of a wimp for AHS, and I'm not sure I'd like Stranger Things, although I feel like I should get around to it, as everyone loves it! Atypical is amazing though, and it seems fairly accurate I think? And also hilarious, but not in a mocking way, which I think is a pitfall many shows about mental illness fall into. I've actually just filmed a video about this, and it'll be going up in a couple of days if you're interested! I loved Atypical so much. Absolutely the best thing I watched this year. Stranger things is now my all time favourite TV show, its sooso good - I'd recommend watching Riverdale if you haven't already, thats a good one! I have to agree with you on AHS and Stranger Things both are amazing! I started watching Atypical and kinda got bored of it but I hope to try watching it again. I would recommend Riverdale but just watch season 1 as season 2 so far is awful. You do very well to share articles well to know. Thank you for sharing this story.